A chance to further our collaborative musical journey is not to be missed. So, when Evelyn asked if I could write a piece for her 2017 King’s Cross Musician in Residence, the answer was always going to be yes… especially as so much of our creative brainstorming is accompanied by copious amounts of cake! 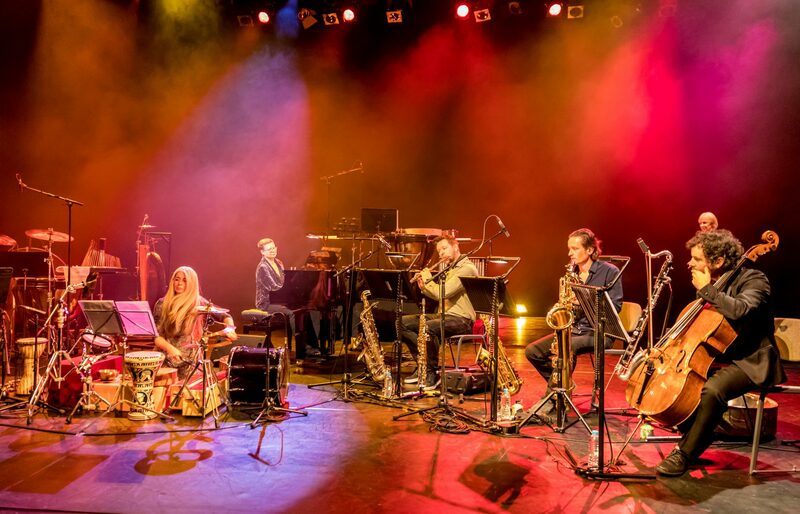 I’ve always enjoyed percussion, from the intricate and rich sounds of jazz drummer Jack DeJohnette, to the Brazilian sounds of Airto Moreira, to the mysterious sounds of Ravi Shankar, and the many colours pulled from an orchestral percussion section. What Evelyn brings to the table is flavours of all of these and something entirely different. This difference can be described as a unique sound-world, a world of evocation, of other-worldliness, of the familiar yet somehow defying definition… well, you get the idea. Evelyn’s world is one of constant exploration and discovery, and as this is also true for composers, it is always an absolute joy to be working together. Well I use the term ‘working’ loosely…. think of your best friend when you were five years old and creating make-believe and mischief [along with huge amounts of hard work of course]! Back to the project: how to sum up King’s Cross in music? Back to the cake and discussions. We didn’t want to be too literal. Rather the music would create an atmosphere, a feel, an experience of the place. We decided to write several short movements, each specific to one aspect of King’s Cross. We came up with six movements; The Spaces In-between [quiet spaces]; In Motion [travel]; Outside the Box [future]; Echoes From the Birdcage [how sound interacts with the buildings around the bird cage sculpture that is at the heart of King’s Cross]; Global Chant [multicultural]; Echoes Past [moments in the history of King’s Cross]. These movements were our take on King’s Cross, but there are so many more we could have chosen. The residents and passers through the area were asked to record sounds and recount their experiences which helped inform some of the music. A small ensemble was required. The ensemble needed to incorporate improvisation, along with the potential for mixing musical colours, so flexibility and doubling of instruments would be required. The final line up is two wind players doubling saxes, clarinets, flutes; one cello; piano, and percussion. We decided not to use large tuned percussion [a marimba or vibraphone for example], but to try and create vignettes with smaller, mostly non-tuned instruments. I think of Evelyn as a musical magician…. give her a kitchen plug, she will conjure weird and wonderful sounds from it… so the compositional problem solving came not from this aspect, but rather from thinking how we could musically approach each movement in the first instance. Some would write themselves: the quiet spaces cried out for a gentle, contemplative mood [cello, waterphone, piano]; while the travel movement had to be in constant motion, with an ever-increasing freneticism. Other movements proved more elusive to tie down. Outside the Box had almost infinite possibilities, which doesn’t always make for the best creative decisions. To quote Igor Stravinsky: ‘The more constraints one imposes, the more one frees one’s self’. An initial half day at Evelyn’s office with Ian East with some of his saxes, gave us the idea for Evelyn to play the bass clarinet as a percussion instrument. We knew we were going to use the instruments in unconventional ways for this movement, but it wasn’t until the initial percussive bass clarinet bars were written, that the idea for an all percussive movement came about…. everyone in some way using their instruments, and voices, percussively. The only problem we came across in performance was that the playing of the piano strings would occasionally knock the tuning out, an effect that one audience member thought we’d planned! One of my greatest joys as a composer is is giving the music over to wonderful performers who imbue it with life, each infusing their own musical personality. This was and is, a true collaboration, with Evelyn and the instrumentalists adding their own inspirations and colours to the written score, the end being so much more than one person’s vision. [With massive thanks to a truly great production team – Martin Collins and the Artstrust productions].